MURTAUGH - In a unique move, rodeo and radio commentator Zeb Bell has taken his radio show to the ranch - literally. Bell, who has for years been a popular PRCA rodeo announcer throughout the U.S., also has a yen for environmental issues, or rather for anti-environmental issues. The Murtaugh resident is adamantly opposed to the environmentalist moment that is currently underway, protecting plants and animals at the expense of humans. And oft-times that philosophy is the background for his talk shows, which air every Monday through Wednesday on K-BAR Radio, 1230 AM. "It was a real good move to bring the talk show to the ranch," said Bell, who presents the one and a half hour long show out of an office at his ranch house along Highway 30 near Murtaugh. "It has given a completely unique flair to the show, and I think we are the only radio station in the state, at least to my knowledge which does a show of this sort, from a private home." Bell leased the airtime from the owners of Tri-Star Broadcasting, Al and Kim Lee, and has "done his own thing," presenting just about every view on every subject imaginable. 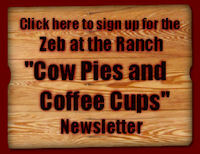 The show airs at 8:30 a.m. on each of the three days, and is titled, "Zeb at the Ranch." Bell said he prepares for each show by spending at least two hours daily combing through about 30 different magazines and newspapers. "I'm not trying to be a cutsie show," Bell said. "That's exactly what I don't want. I'm a confirmed conservative and proud of it. My motto has long been 'the way things were is the way things ought to be,' and I am all for seeing American return to the grassroot values that made it a much stronger country 35 years ago than it is today." Bell said the purpose of his show is to make people think and sometimes get their ire up enough to make them take action about some issue. "The liberals in this country are tearing apart the fabric of our society," Bell said. "If you don't believe it, go to the library and get a 30 year old history textbook and compare it to today's text that is being taught." Bell said having his show on the air like it is has afforded an opportunity to stimulate a readership from all over. "It's amazing who picks up the show while traveling along the freeway out here," Bell said. "I get cell phone calls from people traveling through from Salt Lake City to Seattle, from Moscow to Miami." Bell said his hopes to one day have his show syndicated, something that is not all that far away, because he can take the show anywhere at any given time. "This show isn't one that is written down and read from cure cards," Bell explained. "Everything I do comes directly from my head and my heard. Even my advertisers get impromptu ads that come from the heart." He points out that his philosophy about his show is often to play the devil's advocate, evoking reaction to various issues. "Not everyone agrees on today's issues," Bell said. "I often do and say things that will get people off dead center and do something." Bell said his wife, Deanne, is his bookkeeper and organizer. he said the effort she puts into his show is what keeps him all together. Bell travels a great deal, often 20-25 days out of the month, especially during the rodeo season, and at those times, Steve Mitton at KBAR radio, takes over and does a great deal to help Bell. "It's certainly a team effort, in some senses, because Steve and Jerry Thaxton have been a great support to my show, and I appreciate their help." Bell said. "I also appreciate the opportunity Kim Lee has given me to do this show my way."